Your stay at Blue Skies Guesthouse includes waking up to a steamy mug of coffee or tea and a continental breakfast. Blue Skies has three bedrooms upstairs - the Yellow Room, the White Room, and the Middle Room - and a lovely, two-season porch room overlooking the gardens and front lawn on the first floor. The rooms are charming, quiet, and comfortable. 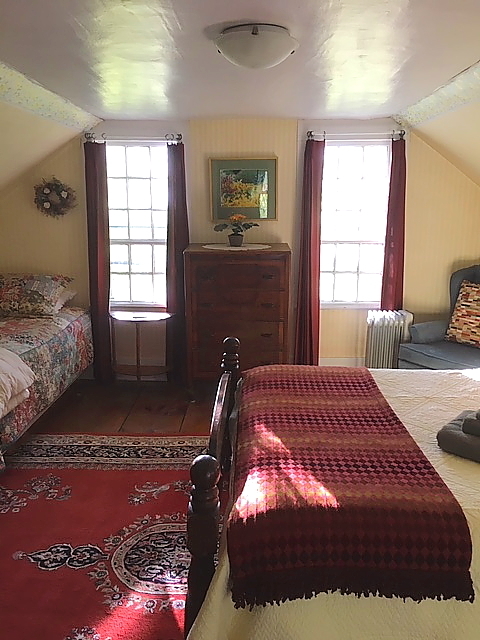 The Yellow Room and White Room have queen-sized beds and the Middle Room and porch have twin beds. Two rooms can accommodate the addition of a twin bed. The rooms share two bathrooms downstairs. Common areas include a spacious living room, with a wood stove, and a large kitchen with dining table and a long central counter. Windows line both sides of Blue Skies, providing stunning views of both the Green Mountains of Vermont and the White Mountains of New Hampshire. Guests are welcome to borrow books from our library. *Minimum two-night stay. Add 10% Vermont sales tax to all room rates.